The Arizona Supreme Court ruled unanimously Monday that illegal immigrants protected from deportation under former President Barack Obama's Deferred Action for Childhood Arrivals program are not eligible for in-state tuition rates at state universities and community colleges. Press coverage is glossing over the fact that the state's educational establishment unilaterally took obviously illegal actions to institute this practice, directly defying a 2006 measure approved by 71 percent of the state's voters. I have found no media report recognizing that Monday's decision, as Arizona Attorney General Mark Brnovich explained in his related press release, is the second straight unanimous court decision. The Arizona Court of Appeals ruled identically 3-0 in June 2017. In 2006, Arizona voters approved Proposition 300 with 71.4% of the vote. The law provides that state-funded services and benefits, including in-state tuition and financial aid, can only be provided to individuals who have legal status. Coverage of the decision at the Arizona Republic notes that the law "specifically includes in-state tuition as a public benefit only for people with legal status," but called that detail a mere "wrinkle in the argument over lawful presence." Maricopa (community) colleges ... took the lead in deciding to offer resident tuition to dreamers. In 2016, after a trial judge sided with the colleges, the Arizona Board of Regents changed its policy and also offers in-state tuition to DACA recipients who meet other residency requirements. Although this DHS gambit didn't work with Arizona's in-state tuition breaks, DACA recipients gained the ability to obtain driver's licenses in Arizona in 2014 — a "right" which withstood a final U.S. Supreme Court challenge in mid-March. 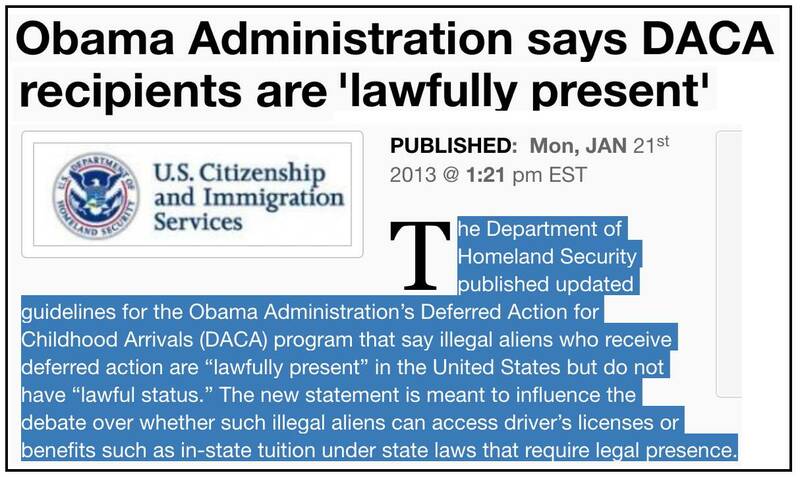 Somehow, Obama's HHS arbitrarily decided in August 2012 that DACA recipients are not lawfully present, and therefore "are not eligible for ObamaCare ..."